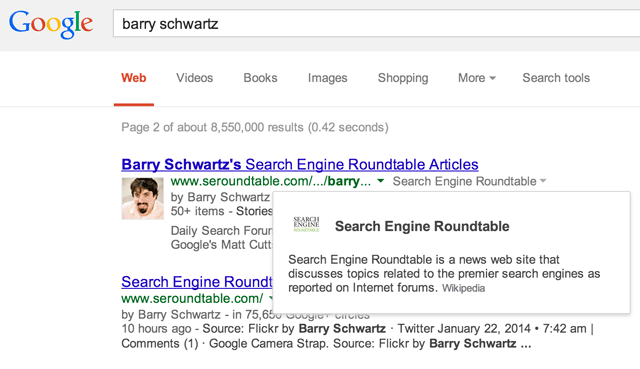 Google announced something they've been testing to include knowledge graph information on sites that are "notable". The notable sites are accompanied by little hyperlink drop downs that expand an overlay of information directly on the snippets. There can be multiple snippets on a search results page with these overlays. The logo links to the Google+ page for the Search Engine Roundtable and the Wikipedia links to the bio of the this site at Wikipedia. Some links are also accompanied by "Owned by" links, which cites the site's owner, when applicable. Some other overlays include some factual data that you might get in the knowledge graph. Google's Bart Niechwiej said this is to "help you learn more about the websites you see in your search results, starting today you may see more information about them directly on the results page when you search on your desktop." Previous story: Does Google Read Content Within Strike Or Del Tag?